Application Summary - 2000 : 2004-98 Jeep Grand Cherokee. This part generally fits Jeep vehicles and includes models such as Grand Cherokee with the trims of Laredo Sport Utility 4-Door, Limited Sport Utility 4-Door, SE Sport Utility 4-Door, Special Edition Sport Utility 4-Door, Sport Sport Utility 4-Door. Edelmann 80239 Power Steering Pressure Hose. In fact, it's kind of our thing. Typically we don't know what we are buying until it shows up. Pet Supplies. Furniture &. Electronics &. Check Out Other Great Products We Have! Application Summary - 2000 : 2007-04 Toyota Highlander; V-6 3.3L. Hose / Line Color / Finish : Black/Silver. Hose / Line Lining : Steel. Hose / Line Outer Material : Rubber/Steel. This part generally fits Toyota vehicles and includes models such as Highlander with the trims of Base Sport Utility 4-Door, Limited Sport Utility 4-Door, Sport Sport Utility 4-Door. Part Number: 70213. Warranty Duration:1 Year. 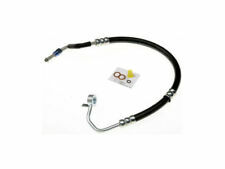 "Edelmann Power Steering Hose --. Notes : 3/8 in. Captive Seal x 16mm Swivel O-Ring, This Power Steering Pressure Line Hose Assembly is an Alternate Design. NOT an OEM Design. Highly-resistant to high pressure and temperature. "Edelmann Power Steering Hose --. General Warranty Limitations (Applies to all Product Warranties). The warranty is subject to the General Warranty Limitations below. Quantity sold : Sold individually.